When LTE made its debut in a big way, customers were greeted with amazing data speeds. They were also greeted with service that drank handset batteries dry faster than Michael Schumacher could put away Formula 1 victories. Right now, all the carriers in the US that have an LTE network, except one, use those networks for data services only, letting their incumbent 3G or 2G systems handle the voice calls. Even with that combination, LTE data connectivity puts a lot of drain on handset battery life. The reality is that carriers are just getting into optimizing the networks while they work feverishly to roll out the service as fast as possible. 2G and 3G services have been tweaked and arguably perfected over the years. LTE is nowhere near that stage yet. Carriers are eager to migrate voice services off the traditional circuit-switched calling (a wireless version of a traditional phone call, constant signal handed off until concluded) set-up and incorporating them with data calls in the same way that many businesses utilize voice-over-IP (VoIP). 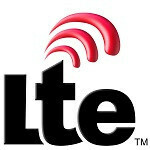 In this case, it is known as voice-over-LTE or VoLTE. Handling the voice like data is far more efficient for carriers, especially on the back-haul since a dedicated line is not required to carry the call, packets of data can be dynamically managed and reassembled without a dedicated circuit to carry the signal. Spirent Communications has conducted some tests on a commercial VoLTE network and made a discovery that will not surprise you if you have used LTE for data. 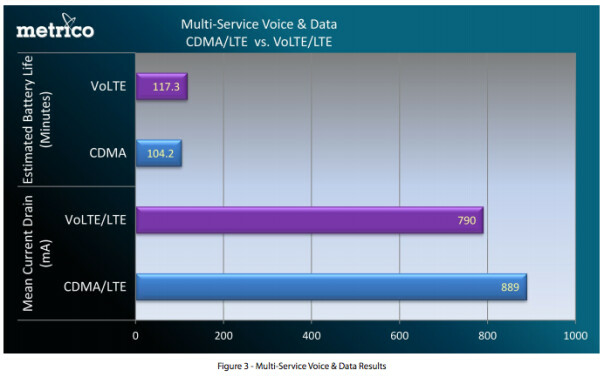 VoLTE chews through batteries twice as fast as a traditional voice call. While Spirent did not state which network it conducted these tests, it is easy to figure out because MetroPCS is the only carrier with a commercially deployed LTE network with a commercially available VoLTE handset, the LG Connect 4G, which has a 1540mAh battery. The power consumption between the two technologies for a 10 minute call was quite revealing. 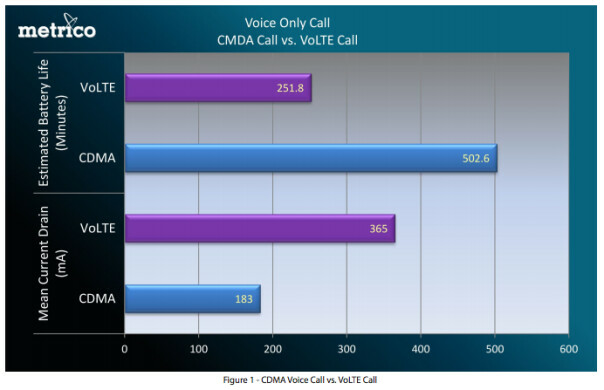 A CDMA circuit-switched call was 680 milliwatts (mW) whereas the same call using VoLTE was 1358mW – double the energy, while other data connections were turned off. This is not solely about the network, though the LTE network will still need some optimization as carriers prepare to enable VoLTE. There are hardware considerations to this as well. Right now, in the current configuration, the handset does work a bit harder utilizing VoLTE. The handset is converting voice to packet data, then transmitting and receiving over the data network where it is converted to voice again. From a pure data point of view though, much work needs to be done. That is why devices like the Motorola Droid RAZR MAXX HD with its monster 3300mAh battery exist. All is not lost though. Spirent did determine that when the phone was used for voice and data simultaneously, it was more battery efficient than when the device was performing a traditional circuit-switched voice call and running data over LTE. Despite the slight advantage however, both scenarios still had the battery gasping for a charger very quickly. In the end, it is not something that is expected to be too terribly worried about. Handset hardware will adopt the needed refinements and the networks will too as the build out completes itself over the next few years. While VoLTE is not very efficient now, it will be as carriers and hardware are optimized for a true single mode on the network: data. great technology but unless it drains so much battery and battery technology is rubbish, it's highly impractical. How about we get LTE and voice/mms on the same chipset allowing us to talk and surf at the same time first.... ahem Apple. Never trust anything fully, this your first day on the internet? Wait isn't the Droid Razr HD VoLTE? When you check it's stats it clearly says talk and surf at the same time and it's a Qualcomm chipset so it's a given that it's a pretty good set up. Oh well they need to refine the power draw of LTE in cellular devices because that mess draws way too much power to do the same thing 3G service used to. In few short years it should be upgraded significantly, until then we'll be playing hand off from LTE to 3G. no need lte! 4g itself would be just fine..